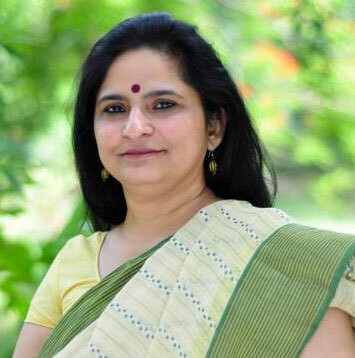 Dr. Shubhra P. Gaur, has a D.Phil in Psychology from the University of Allahabad, Allahabad and has twenty five years of research and teaching experience. She has been at MICA since 2001 and is currently Programme Chair- PGP and Admissions Chair at the institute. In previous years she has held many key positions at the institute, including that of Head: Faculty Affairs and Founder Chairperson of Gender Equality and Anti-Sexual harassment committee, Chairperson of Admissions (PGP) and General Management Area. She has earlier taught at the University of Delhi. She has been a visiting faculty at the IIM Ahmedabad, School of Petroleum Management (SPM), Pandit Deendayal Petroleum University (PDPU) Gandhinagar, Mahatama Gandhi Labour Institute, Ahmedabad. Her teaching areas are: leadership; personal, interpersonal, group and organisational dynamics; creativity; stress management; cross cultural and gender issues at workplace. She has published articles in Psychological Studies, International Journal of Learning, Journal of Asian Communication and Media Asia, amongst others in the areas of physical and psychological abuse amongst women, gender issues at work place, psychosocial competence and work related stress; interpersonal and internal communication. She has been awarded research fellowship from the University Grants Commission. She has also been honoured with the award for the Best Teacher in Human Resources Management in 2011, by Dewang Mehta Business School Awards in recognition of leadership, development, innovation and industry interface. Recipient of The Dewang Mehta Business Award for Best Teacher in Human Resources Management in 2011, which recognises talent and leadership amongst the Business Schools across India. Gaur, S.P., Pant, S. & Sinha, A. (2014). Communication & women empowerment: Issues and challenges. (pp. 259-285) In A. Mohapatra (Ed. ), Development Issues in India: Policies and Perspectives . Delhi: Mangalam Publishers and Distributors, 2014. Gaur, S. P. & Jain, S.S (2013) Gender Issues in Work & Stress (pps 179-207). In Pestonjee, D.M. and Pandey, S.C.(Eds) Stress and Work: Perspectives on Understanding and Managing Stress. Sage Publications- Response Books. 2013. Pandey, S.C. & Gaur, S. P. & Pestonjee, D.M. (2013) Methodological Issues in Stress Research: Challenges, Concerns and Directions (pps 323-347). In Pestonjee, D.M. and Pandey, S.C.(Eds) Stress and Work: Perspectives on Understanding and Managing Stress. Sage Publications- Response Books. 2013. Gaur, S. P.(2014) Relationship of Learning Stage and Follow-up plan based on Feedback( FPF) on Academic Performance using Kolb’s ELT. In S. Narayanaswamy (Ed. ), 2014 International conference on social science and management (pp.463-490). Lancester, Pennsylvania, USA: DEStech Publications, Inc. It is indexed in ISI (Institute of Scientific Information) and Google Book Search. Bhattacharjee, A., Gaur, S. P. & Pande, R. (2011). Perceptions of practicing and prospective women executives from India about Indian business newspapers. Asian Journal of Communication,21(6), 613-631. Gaur, S. P., Bhattacherjee, A. & Pandey, R. (2010). Gender comparison of consumption of business information in India: the consumer’s perspective. Media Asia, 37(3), 123-135. Gaur, S. P., Lakhtakia, A. & Kohli, G. (2009). Winning strategy in turbulent times: total supply chain solutions for IT and ITes industry. PES Business Review, 4(1), 43-52. Gaur, S. P., Kohli, G. & Khanna, Kriti, K. (2009). Learning Centered innovation in management education: Kolb’s ELT. The International Journal of Learning, 15. Gaur, S. P. (2006). Achieving inter-gender communication effectiveness in organizations. VISION, 10(2), 11-19. Gaur, S. P. (2004). Nucor Corp’s Organizational Culture. Case Folio, April, 2004, 37-38. Gaur,S.P. & Dhawan, N. (2000) Work Related Stress & Adaptation Pattern Among Women Professionals. Psychological Studies 2000 Vol 45, Nos. (1&2) 58-64. Dhawan, N., Punetha, D. & Gaur, S.P. (1993)Abuse & the Indian Women. In Northern India Patrika – February 20, 1993. Gaur, S. P., Bhattacherjee, A. & Pandey, R. (2010). Perception, Satisfaction and Consumption of Business Information: A Gender Gap Presented at the International Conference on Communication and Media 2010 (i-COME20l0 ) held at Melaka, MALAYSIA from 18th to 20th June,2010. Gaur, S. P (2008) Invited as Distinguished Speaker on the topic Employee Surveys: Selection & Development of Instruments at the HR Conclave on 'Changing Paradigm in HR Management-emergence of Human Resource Marketing' IIPM Ahmedabad on 9th August, 2008. Gaur, S. P. (2003). Gender Stereotypes: Barrier to Effective Inter-gender Communication In organizations. Presented at the First AIMS International Conference on Management (AIMSCOM) held at the Indian Institute of Management, Bangalore. Dec 28-31,2003. Gaur, S. P. (2003). Invited to chair the session titled : Organizational Behaviour at the First AIMS International Conference on Management (AIMSCOM) held at the Indian Institute of Management, Bangalore. Dec 28-31,2003. Gaur, S. P. (2003) Development of a Work-Related Stress Scale Presented at the Research Workshop on HRM LJ Institute of Management Sciences & IDEA Foundation, May 24,2003. Gaur, S. P Communication Skills for Personal Effectiveness Invited Speaker at UGC National Workshop on Stress Management organized by MS University of Baroda. Gaur, S. P & Ghosh,E.S.K. (1994). Stereotypes In Gender Perception In India. At the XII Congress Of Cross Cultural Psychology 1994. Gaur, S. P. & Dhawan,N (1993). Work Related Stressors And Psychosocial Competence Patterns Of Women Professionals In India. At the 4th Annual NAOP Convention 1993, New Delhi. Dhawan,N & Gaur, S. P. (1992). Psychological Abuse Among Indian Women. At the XII IACCP Conference, Liege, Belgium 1992.